On June 24, Jean-Claude Juncker, the president of the European Commission, convened what was dubbed an emergency ‘mini-summit’ on migration. Sixteen EU leaders, including German Chancellor Angela Merkel and French President Emmanuel Macron, accepted the invitation and travelled to Brussels. Migration has once again become one of the most controversial issues in the bloc, having subsided since the heights of summer 2015, when hundreds of thousands of migrants and refugees made their way to central Europe. The continent has seen an increase in undocumented migration over recent years, with the European Border and Coast Guard Agency (Frontex) registering 2.3 million illegal border crossings into the EU in 2015 and 2016. In 2017, this figure dropped to over 200,000 illegal border crossings - its lowest level in four years. However, the factors driving the displacement of populations and migration to Europe have not disappeared. According to the UN Refugee Agency, around 44,000 people were forced to flee their homes daily in 2017, with developing economies hosting 85% of refugees. Despite a decrease in the number of arrivals, member states are divided on how to handle Europe-bound refugees and process the applications of those currently living in Europe. Several governments including in Italy and Hungary have adopted drastic new legislation to crack down on illegal migration. On June 26, Poland’s Interior Minister Joachim Brudzinski said that the group of Eastern nations was “united against the uncontrolled influx of migrants”, concerns echoed by the other Visegrad countries of Poland, Slovakia and the Czech Republic. This position has put the Visegrad group and Italy at odds with the French and German governments, which have advocated sharing responsibility for migration. But after the latest EU summit exposed deep divisions between European nations, observers fear the migration debate could lead to a renewed crisis within the bloc. "Europe faces many challenges, but that of migration could become the make-or-break one for the EU," Ms. Merkel said on Thursday. The emergency summit convened on June 24 can be seen as a rehearsal for the much-anticipated European Council meeting at the end of June. Several countries were conspicuous by their absence. The four members of the Visegrad Group boycotted the event. The proposals put forward during the meeting highlighted the diverging interests of the countries present. Ms. Merkel and French President Emmanuel Macron reiterated their support for Europe’s shared responsibility for refugees and asylum seekers and are seeking to address "secondary" migration of refugees between EU member states. Ms. Merkel is facing pressure from Interior Minister Horst Seehofer, leader of her Christian Democratic Union’s sister party, the Christian Social Union (CSU), for her handling of the migration question. “Angela Merkel faces a lot of pressure at home and knows she has two weeks to come up with a solution,” Hanne Beirens, associate director at the Migration Policy Institute, told The World Weekly. 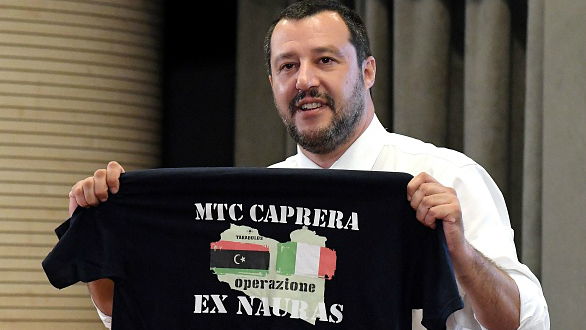 In contrast, the new Italian government, led by a coalition of the hard-right League party and the anti-establishment Five Star Movement (M5S), has called for an overhaul of the Dublin agreement - which determines EU member states’ responsibility for asylum applications - and the establishment of screening centres in North Africa. All member states, however, agreed on one point: the need to strengthen Europe’s external borders. "Nothing new has come to the table besides repeating commitments to beef up the European Coast and Border Guard Agency and do more to protect the external border," Camino Mortera, research fellow at the Centre for European Reform, told TWW after the ‘mini-summit’. "This has been on the table for a long time now but will not solve the main problem: how to reform the part of the Dublin system determining which country is responsible to register and process asylum seekers." The migration crisis has had a profound impact on European politics, which has seen the rise and electoral success of anti-establishment parties. France's National Front led by Marine Le Pen made it to the second round of the French presidential elections in May 2017, with her campaign built on the promise to reduce migration. The far-right party Alternative fur Deutschland (AfD) came third in Germany’s elections in September 2017 and is now the largest opposition party in Parliament. A critical component in this equation is Italy, which is the first port of arrival for many migrants and refugees trying to cross the Mediterranean Sea from North Africa. In the run-up to the elections in March M5S leader Luigi di Maio vowed to put an end to what he called the "sea-taxi service" that allowed thousands of migrants to reach Italian shores – 9,000 since the beginning of the year, according to figures from the International Organisation for Migration. Shortly after taking office, the Italian government made international headlines when Interior Minister Matteo Salvini ordered the coast guard to turn away the Aquarius, a rescue boat carrying 224 refugees on board. Elsewhere in Europe, governments have taken measures which many see as defying EU rules. About two months after Hungary's Prime Minister Viktor Orban’s re-election on what many characterised as an anti-migration platform in April, the Hungarian Parliament passed a law that criminalises any group or individual offering help to asylum claimants. The law has become known as the "anti-Soros law" in reference to George Soros, the Hungarian-American billionaire philanthropist who has funded organisations and initiatives that supporters say promote human rights in Hungary. Central and Eastern European countries including the Czech Republic and Poland previously faced legal action from EU institutions over their rejection of migrant quotas, a scenario that observers say could repeat itself. As the migration question takes centre stage again in Europe, the EU faces a number of challenges. For Chancellor Merkel, the migration question is a litmus test of her popularity at home. Mr. Seehofer has announced a proposal on migration that could see migrants being turned away at the German border if they have registered elsewhere in the EU. Ms. Merkel announced on Monday that the CSU and CDU had agreed on seeking bilateral agreements with other EU states that could allow Germany to turn away refugees at the border. Despite these declarations, Ms. Merkel’s coalition remains fragile ahead of regional elections in Bavaria this autumn. The CSU fears the AfD could cause it to lose its majority; such a loss could have deep implications for the coalition in Berlin. Across Europe, divisions between supporters of shared responsibility for migration and their critics continue unabated. All EU member states have committed to strengthening Europe's external borders but no internal solutions on the redistribution of migrants across Europe were agreed on during the emergency summit. "The idea of external processing is not new," says Marie de Somer, head of the European Migration and Diversity Programme at the European Policy Centre (EPC) in Brussels. "We see enormous dangers in externalising the question completely. Migration should also be addressed internally. EU member states need to implement a system of responsibility sharing and find a way to redistribute migration across member states." As EU member states continue to seek a solution and domestic considerations impact the debate, NGOs are concerned about the human rights implications that protracted negotiations could have. “With governments attempting only to reduce the number of asylum seekers they are willing to host, people are being abused and pushed back between borders, at the EU's Eastern borders and between France and Italy," says Raphael Shilhav, EU Migration Policy advisor at Oxfam. Bridging Europe’s divides over how to handle migration, it seems, will be no easy feat.